Happiness, it’s something we all describe differently, what makes one person happy would not be the least bit pleasant to another, but never the less it is an emotion we all strive for each and every day. Regardless of how we are feeling and what is going on in our inner and outer world, there is always a reason for us to switch from an emotional state of struggle and stress to pleasure and contentment, it is just a matter of changing your mind. First, we must recognize where our thoughts come from, once we are consciously aware of the thinking patterns we are then most capable of turning off our negative thoughts to more positive ones. It is our ego mind voice, the one inside of our head which dictates how we feel internally, and more often than not when we are aware of this mind voice, the messages we hear are usually negative. Negative thinking drags us down the preverbal doom and gloom black hole, somedays the hole is darker than others. We worry and we stress, we regret and we blame but if you want to place the blame for your depression or unhappiness on anyone, well I’m afraid it would have to be you. Choices are something a human holds the power to make if something in your life is in disarray rest be sure the Universe is pushing your to make some choices, which will usually involve change. 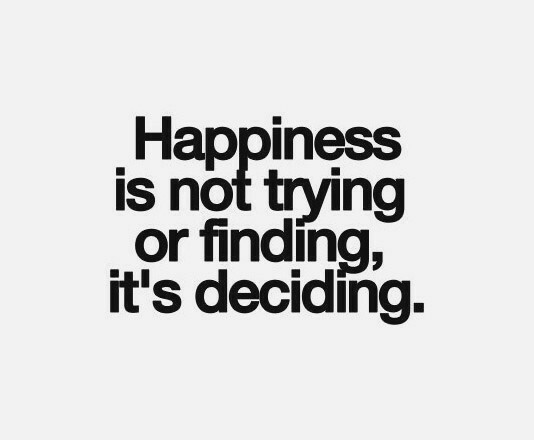 Your happiness is your responsibility, no one knows what you need for yourself better than you do, therefore finding your way to happiness is either a matter of changing your thoughts from negative to what you feel blessed for or making bigger changes such as to your external life. Happiness is something we tend to deny ourselves, I can attest to this myself, making other people happy is much more rewarding, but the thing is what we don’t ever think about is we deserve to be happy too, of course, we do!! Have a look at the way you are living your life today because if you have a really good look, I know you will become more conscious of where you can change it up. let the bliss in and stop worrying so much.